I noticed kale was on sale this week at Shaws and so I ventured to the web to get some ideas for what to make. I feel like I always come across recipes and dishes at restaurants that have kale in it and while I am intrigued, I don't usually bite. This time, I bit! 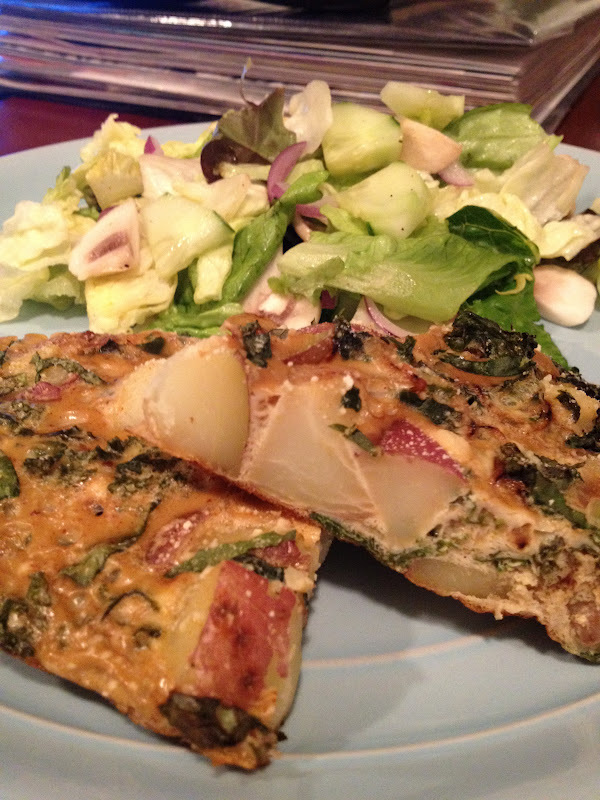 I bought the kale with this recipe in mind - a frittata, which I usually make for breakfast, was on my schedule for Tuesday night dinner. I like the idea of eggs for dinner paired with greens, which is exactly what I did tonight. 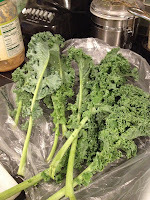 The kale will need to be washed, trimmed, blanched for 3-5 minutes in boiling water and then drained, squeezed well of the excess water and chopped. To trim it, fold it in half and cut along the thick spine in the middle, throwing out the tough middle piece. 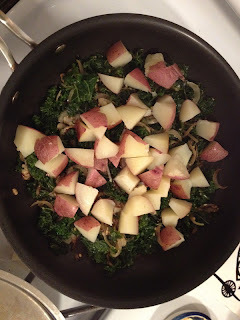 Cook onion for 5 minutes over medium heat (stir around so that one side doesn't burn), then add kale and garlic. Continue to cook for 5 mins more. Add the potatoes and stir to mix. Combine whisked eggs with 3 TB water, paprika, and a dash of salt and pepper in a large mixing bowl. Add the sauteed kale mixture to the eggs, stirring to coat the mixture with the eggs. Spray the saute pan you had been using for the onions so that the eggs don't stick and then pour the egg and kale mixture back into that pan. Heat over medium for just a minute or two until the eggs set a bit. Sprinkle the top with the chopped fresh basil and a sprinkle of parmesan, then put your pan into the oven to bake for 6-7 minutes until your eggs are cooked through! I liked this combination, but it needed more egg compared to the rest of the ingredients so I adjusted the ingredients above accordingly. It was also a bit bland, so it will help to be pretty generous with the salt and pepper. I served this with simple mixed greens with a lemon vinaigrette! You could also serve this at breakfast or brunch very easily. When I lived in Brookline I was conveniently close to a sushi place called Super Fusion Sushi. I almost wouldn't call it a restaurant because there are literally 3 tables and almost everyone just gets their sushi to go. The fish is fresh, portions are great and prices are even better! Soon after moving to Cambridge I was happy to hear that Super Fusion had opened another location right in Porter Square. Given both the Brookline and Cambridge locations have limited seating, our backup option is to get our sushi to go. I think all of this above was just $25! They have a great combo deal, the Fusion Maki Combo, for just $10 which includes 3 rolls - tuna maki, california maki and shrimp tempura maki. Plus all of their basic maki rolls are under $6. *Note - They also have a location in Watertown that is supposedly their largest location with lots of seating, but I haven't been there. I've also heard they may have recently opened a 4th location in Jamaica Plain! Lord Hobo - not a biker bar after all ! Every time I walk to Kendall Square from my place I walk by this place called Lord Hobo - and for some reason I've always thought it was a biker bar. Thinking back, I have no idea where I came up with that. After a friend recommended it for dinner last week, I learned that it is in fact, a great little bar and restaurant! The outside leaves a little to be desired, but the inside is pretty big and we had an easy time getting a table for the 5 of us. There's a really big drinks menu with a diverse offering of beer on tap. I enjoyed a 'South Hampton Double White' and some of the other girls tried out the 'Victory Summer Love.' They call their menu New American so it has a mixture of new takes on some traditional dishes - like truffle fries, house made pickles, turkey chili with plantain, chicken lollipops. After seeing someone else's order go by we decided to share an order of the Polenta Fries (with garlic aioli, $7). They were clearly just made - very crunchy on the outside with freshly grated parmesan and a flavorful aioli to dip the sticks into. 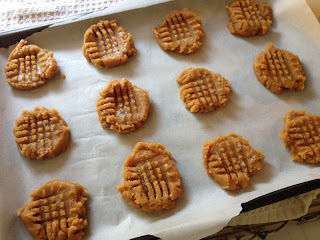 In an effort to find a gluten-safe dessert I remembered a friend of mine making flourless peanut butter cookies a couple months ago and started searching the web for a recipe that seemed good. If you do this you'll find that there are a million different recipes listed out there, but I decided on one from PBS and I can say that this one definitely has The Academic Chef's stamp of approval! 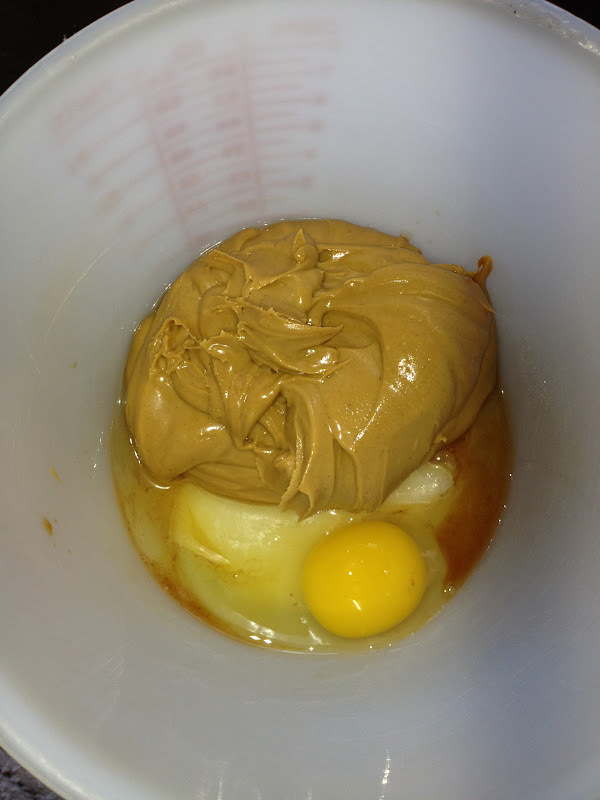 Using a mixer, mix together all of the ingredients on low speed until well combined. Using two spoons, scoop small spoonfuls onto the baking sheet about an inch apart (12 per sheet). 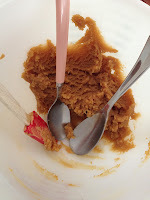 Using the back of a fork, making an indentation into the dough, pressing it down and then cross the tines of the fork in the other direction to make a sort of square mark on the cookie. Don't press too hard. Bake the cookies for 10-12 minutes and transfer to a cooling rack. My parents had some friends visiting from Europe last weekend which overlapped with one of my weekend trips home. I volunteered to be on cooking duty for the weekend visitors and with their allergies, I was up for a challenge. Originally I thought there more allergies than it turns out there were so I was tasked with cooking without corn, soy, gluten and dairy. No small feat! 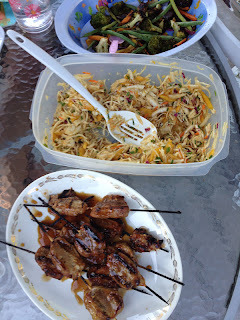 After planning an Asian themed night for the Sunday, I was grateful to realize that I was okay to cook with soy because you guessed it, almost anything Asian likely has soy sauce in it! Empty the bad of shredded cabbage into a large serving bowl. Slice the mango into thin slices and add that to the cabbage, along with the scallions. In a small bowl mix together the vinegar, soy sauce and sesame oil - don't substitute the sesame oil with another kind, the sesame flavor is an important one! This part could be done in advance but only add the dressing about 1/2 hour before serving. Just before serving stir again to make sure the dressing is coating all of the salad and sprinkle the sesame seeds over the top! Along with this Asian Slaw, I also made grilled vegetables and an apricot ginger marinated pork kebabs! The night before I made lemon basil chicken breasts with a tomato bruschetta on top, grilled veggies and my favorite lemon basil grilled shrimp!! I love summer time grilling!